Optimum Nutrition already have a couple of mass gainer proteins on the market including their ever so popular high calorie formula Serious Mass as well as their lean gainer Pro Gainer. To further add to this list as well as to their Gold Standard line, ON has brought out a new supplement known as Optimum Nutrition Gold Standard Gainer. Let’s take a look at what you can expect from the supplement and whether or not it’s something you need. Unique carb blend including Carb10; a specialty ingredient that provides carbohydrates without any massive insulin spikes. Each 203g serving of the Optimum Gold Standard Gainer will deliver 760 calories, 55g of protein, 112g of carbohydrates and 10g of fat. Two sizes of the supplement are available including a 23 serving; 10 lb or 4.5kg bag as well as a 11 serving; 5lb or 2.3kg tub. As a mass gainer, the new Gold Standard Gainer lies somewhere between Serious Mass and Pro Gainer. It offers a fairly large amount of calories and offers a 2 to 1 ratio of carbohydrates to protein. You can still easily term this a lean gainer, but will still suit those who are having a bit of trouble gaining weight. The ingredients though appear to resemble more like the Pro Gainer formula than the Serious Mass one. Providing a nice blend of medium to fast absorbing proteins, the blend will help to provide ample amino acids to your muscles over a period of 4-5 hours. As such, Gold Standard Gainer is best utilised throughout the day and its absorption profile is perfect for those bulkers who might not have the most diligent meal intake schedule. One particular highlight of the supplement is its use of the carbohydrate known as Carb 10. Derived from the power of peas, Carb 10 is a specialty ingredient that was created by Compound Solutions; an advanced sports performance nutraceuticals company. What makes Carb 10 special is its ability to be quickly digested and transported to the muscles where it can work its magic in supporting recovery through glycogen replenishment, without massively raising blood glucose or insulin levels1. Insulin can definitely be a good thing when it comes to building muscle, as it is a very anabolic hormone and can help support better movement of amino acids into the muscle. However, super high insulin levels from a lot of fast digesting carbs can potentially drive fat storage up, as well as create a sluggish, lethargic crash once those levels come down. By using Carb 10, Optimum Nutrition Gold Standard Gainer can help you maintain a leaner bulking body composition, whilst ensuring you’re not too zonked to perform adequately throughout the day. Optimum Nutrition has definitely left their best mass gainer release quite late. The Gold Standard Gainer comes with a lot of pros, but not a whole lot of drawbacks. It would have been great to see ON add in some extra fats from medium chain triglycerides (MCTs) or conjugated linoleic acids (CLAs) into the mix, but it’s a relatively minor oversight. The new ON Gainer comes in four flavours at the time of review including Colossal Chocolate,Vanilla Ice Cream, Cookies & Cream and Cinnamon Bun. As the release is imminent, we don’t have full taste profiles, but will most certainly update you all as soon as the product is made available. Knowing Optimum though, we really don’t expect anything other than tasty flavours and an easy mixability profile. They’ve advertised that the Gold Standard Gainer is a fast mixing supplement you can mix with a spoon, so time will tell just how true this is. 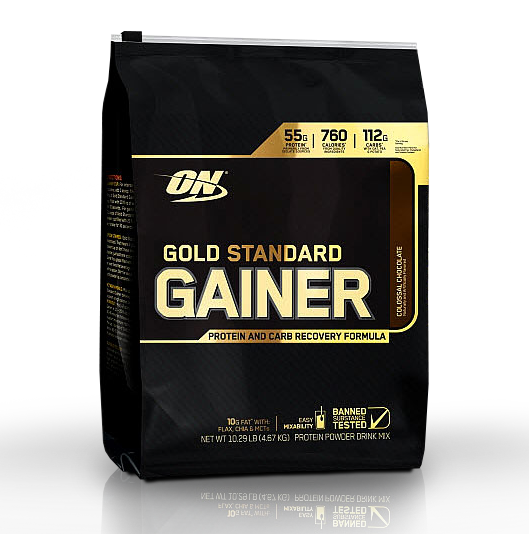 Optimum Nutrition’s Gold Standard Gainer is a fairly high calorie mass gainer that sits somewhere between their two other weight gain protein powders. However, its unique ingredient profile is one aimed at promoting leaner gains with less fat mass. Certified banned substance free, the gainer provides a high quality protein suitable for casual trainers to professional athletes and marks another excellent addition to their Gold Standard range. 1. "Compound Solutions Carb 10". Compound Solutions. N.p., 2016. Web. 24 Aug. 2016.